Worries about a “divided” America are no secret. In the wake of several evenly divided election campaigns and polls showing vast public disagreement on vital social issues, fears are arising that the once “united” states are being riven apart by conflicting views on issues like gay marriage, immigration, and the war in Iraq. As a recent report from the Pew Center for the People and the Press put it, “The red states get redder and the blue states get bluer, and the political map of the United States takes on the coloration of the Civil War.”A lengthy debate on the subject has been taking place in American society for much of the past two decades, touched off by a handful of books published in the late 1980s and early 1990s. The most influential of these were Alan Bloom’s The Closing of the American Mind: How Higher Education Has Failed Democracy and Impoverished the Souls of Today’s Students, and E.D Hirsch’s Cultural Literacy: What Every American Needs To Know in 1987. Both books argued that America had been weakened by a declining cultural values, specifically by the abandonment by schools of the great books and traditions of Western Thought. These debates were summarized in James Jefferson Hunter’s 1991 book Culture Wars. Hunter’s book, whose title gave the conflicts a name, asserted that a new and expansive discontent had taken over the country. “The contemporary culture war is not just an expression of different ‘opinions’ or ‘attitudes’ on this or that issue, like abortion,” Hunter wrote. “The culture war emerges over fundamentally different conceptions of moral authority, over different ideas and beliefs about truth, the good, obligation to one another, the nature of community, and so on.” Several years later, Hunter warned the controversies might even trigger violent conflict. With the dawn of the 2000s the culture wars moved from the margins of academic discourse to the center of mainstream debate and concern. Search the term “culture war” at the Harvard University library and you’ll come up with 1308 entries. The Library of Congress posts over 10,000 books with titles like Culture Wars, Culture War? Beyond the Culture Wars, Is There a Culture War?, Culture Warrior, etc. A Culture Divided explores both the symptoms and causes of these contemporary divides in the United States, illustrating how differences of perspective and opinion have persisted throughout the nation’s history––from the earliest days of the revolution to the most recent events in international diplomacy. 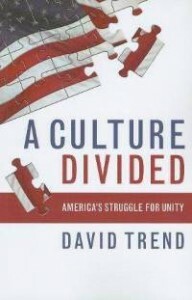 A Culture Divided takes the somewhat contradictory position that the divided character of the American nation is both a curse and a blessing, giving rise to some of the nation’s most vexing social and political problems, but at the same time imbuing the United States with a freshness and vitality that have kept its values relevant––or at least potentially so. In doing this the book makes an argument for increased civic involvement at a time when people often feel overwhelmed and powerless in the face of big government and multinational corporations. Looking to recent American history, A Culture Divided discusses the ways that small pockets of activism and individual acts of political participation become the building blocks of social change and social betterment. Obviously this can be a tricky business. Faced with difficulties and problems––what many politicians euphemistically call “challenges”––it takes effort to maintain a positive outlook. A Culture Divided engages this task by taking a critical look at many of the social conditions and political forces that mitigate against democracy and unity. Barack Obama may have inspired the nation with an inaugural mantra that “We Are One,” but no leader can wave a magic wand of change over a people with so many historical disagreements. Certainly big questions remain unanswered in America’s divided culture. But great possibilities exist as well. Perhaps more than any other country, the U.S. has demonstrated an ability to adapt and change throughout its history. Today America finds itself it a unique moment in its evolving democratic experiment. Will the United States rise to meet this challenge? Taking up the familiar refrain to “think globally and act locally,” A Culture Divided argues that causes are only lost when people fail to take action.